Made me look and feel like a million dollars! Alyn Waterman was the makeup and hair artist at my 50th Birthday Party, and made me look and feel like a million dollars! Everybody commented on how great my hair and makeup was, and there were many famous people in attendance so it was great to look and feel my best. Alyn also did the hair and makeup on several friends of mine, and they looked amazing. Thanks Alyn–I just don’t feel made up without you! Alyn Waterman was the makeup and hair artist at my 50th Birthday Party, and made me look and feel like a million dollars! Everybody commented on how great my hair and makeup was, and there were many famous people in attendance so it was great to look and feel my best. Alyn also did the hair and makeup on several friends of mine, and they looked amazing. 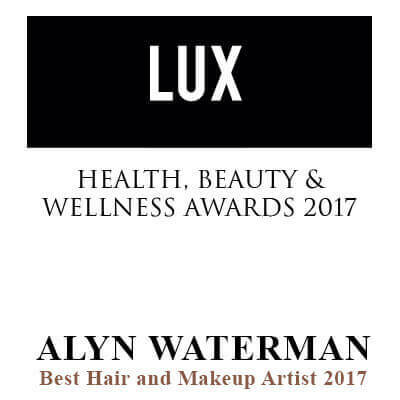 Thanks Alyn–I just don’t feel made up without you! We had our hair and makeup done last night for an event and the finished look was fantastic. Amazing service and he made us feel relaxed. Would highly recommend and will be booking again for the future. Thank you very much. We chose Alyn as he came highly recommended as makeup artist to the stars, and wow did he make me feel like one. He is so talented and friendly and created the most perfect look for my wedding day. His attention to detail and passion for makeup made me trust him completely and I'm so glad he was able to be part of everything. My bridesmaids were impressed too, and we would all highly recommend this incredible artist. He was also a huge hit with my family and now a firm friend for life. We chose Alyn as he came highly recommended as makeup artist to the stars, and wow did he make me feel like one. He is so talented and friendly and created the most perfect look for my wedding day. His attention to detail and passion for makeup made me trust him completely and I'm so glad he was able to be part of everything. My bridesmaids were impressed too, and we would all highly recommend this incredible artist. He was also a huge hit with my family and now a firm friend for life. Thank you for all your help with getting everyone ready on my investiture day at Buckingham Palace and for the party afterwards at Claridges. There’s nothing like a Dame! Thank you for all your help with getting everyone ready on my investiture day at Buckingham Palace and for the party afterwards at Claridges. There’s nothing like a Dame! Love Joan. Thank you Alyn for making me feel and look amazing on my special day. A true professional, friendly, calming and a pleasure to have in my home. Alyn was so friendly and professional during my whole wedding experience. He took the time during my hair and makeup trial to get things just as I wanted so we knew exactly the look we were going for on the wedding day. On the day itself Alyn was great. He made me feel at ease and relaxed, and I was extremely happy with the finished results. I would wholeheartedly recommend Alyn to any bride. Thank you so much. Thank you so much for the makeup and hair for my wedding. You listened and delivered exactly what I was looking for. I can’t praise you enough. I think you do an excellent job. So a big thanks from me. Alyn never fails to make me smile and feel my best. His caring nature and outstanding work ethic go hand in hand and make him one of my favourite makeup artists. I felt a million dollars at the recent soap awards and can’t recommend him enough. He listens and is attentive to my needs always and is flawless. Thank you Alyn, here’s to many more a glamming! Alyn made me look like me but better. It was such a delight to have him as part of my wedding day. Working with Alyn on our daughter Becky’s wedding was one of our very best decisions. He’s relaxed and fun to be with and I would wholeheartedly recommend him. Bride and bridesmaids looked beautiful and confident on the big day and mum and dad were suitably proud. Alyn ensured that my wedding day was stress free and that I looked better than I ever thought possible. His calm and skill made everything go to plan and survived the high winds. A true professional. I booked a hair and makeup appointment for my VIP event. Alyn is highly professional, kind and attentive. He gave me good makeup tips and more importantly made me look super glamorous. I was really pleased with the look and style Alyn created for me and will definitely return in the future. Alyn Waterman is just fantastic at what he does. He is not only an amazing makeup artist, but he just connects with everyone he works with. Alyn was amazing from start to finish on my special day. My makeup was fabulous and Alyn was always there making sure I stayed looking that way through the day. Alyn spoilt me for life. It was great to have him throughout my wedding, not just the arranging of my hair and makeup at the beginning of the day, but also being available to touch up hair and makeup throughout the day and evening. I loved the fact that he created a day and night look for my hair and makeup. It complemented the change of my dress perfectly. It was a very special day made perfect because of Alyn’s attention to detail. Alyn spoilt me for life. It was great to have him throughout my wedding, not just the arranging of my hair and makeup at the beginning of the day, but also being available to touch up hair and makeup throughout the day and evening. I loved the fact that he created a day and night look for my hair and makeup. It complemented the change of my dress perfectly. It was a very special day made perfect because of Alyn’s attention to detail. Alyn and his team joined us at our recent Bridal Event in partnership with You & Your Wedding magazine at the Marble Arch branch of Monsoon Accessorize. Our staff and customers all said how wonderful the makeup and hair was and how lovely the atmosphere was in store that evening. Alyn, thank you for being so kind and making everyone feel pampered and special.You and your team were so professional and it was a pleasure to meet you all. Alyn and his team joined us at our recent Bridal Event in partnership with You & Your Wedding magazine at the Marble Arch branch of Monsoon Accessorize. Our staff and customers all said how wonderful the makeup and hair was and how lovely the atmosphere was in store that evening. 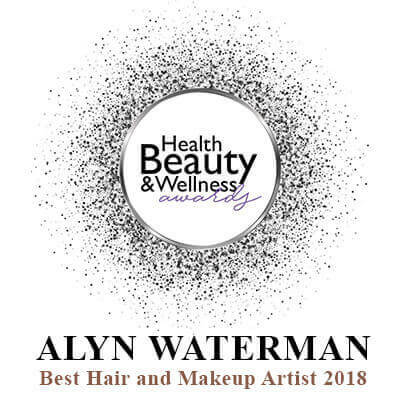 Alyn, thank you for being so kind and making everyone feel pampered and special.You and your team were so professional and it was a pleasure to meet you all. Thank you very much for the fantastic job you did for my wedding. Everyone looked stunning and it was lovely to have you as part of the day. I wanted a 1950’s Hollywood Glamour look and I truly felt like a film star! Alyn made me feel even more amazing than I thought I could! I wanted a 1950’s Hollywood Glamour look and I truly felt like a film star! The wedding morning ran like a dream and we all had so much fun with Alyn and his team … memories that will stay with me forever.